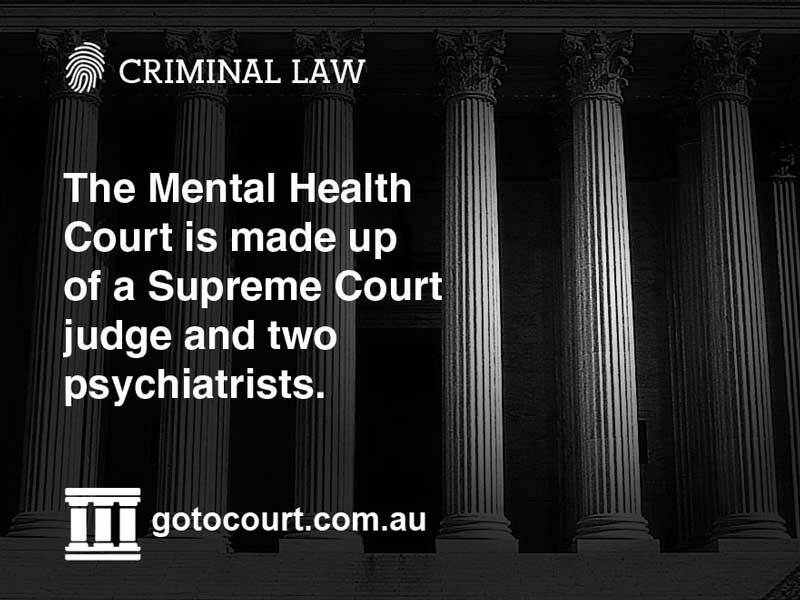 The Mental Health Court QLD was set up under the Mental Health Act 2000. Its role is to decide the state of mind of persons charged with criminal offences, to hear appeals from the Mental Health Review Tribunal and inquire into the lawfulness of patients’ detention in mental health facilities. The Mental Health Court is made up of a Supreme Court judge and two psychiatrists, who advise them on medical or psychiatric matters. Hearings are usually open to the public, unless the person is under the age of 17 or the court orders otherwise. However, the hearing of Mental Health Review Tribunal appeals are not open to the public unless the court makes an order allowing someone to be present. Were they of unsound mind at the time of the offence, or do they have an intellectual disability? Are they unfit for trial? If so, is that unfitness permanent or temporary? If the charge is murder, were they suffering from diminished responsibility at the time of the offence? know that they should not have done the act or made the omission. endure their trial without a serious deterioration of their mental state. A person may be permanently or temporarily unfit for trial. If they are found to be fit for trial the case returns to the criminal court to proceed in the usual way. Otherwise, the person is detained in a Queensland mental health facility and there are regular reviews of their fitness by the Mental Health Review Tribunal. The criminal proceedings will continue if they become fit for trial. They will be discontinued if the person remains unfit for trial for 3 years, or 7 years if they are charged with an offence carrying a maximum sentence of life imprisonment. If the court decides that a person is unfit for trial it must make a forensic order. the protection of the community. If the court decides not to make a forensic order it can make a non-contact order if the alleged offender has been charged with an offence of violence. A non-contact order prevents contact with a certain person. The Court can only make a non-contact order if it decides not to make a forensic order for someone who is charged with a violence offence. Once the order is made, it is sent to the police who can investigate and prosecute breaches. A copy is lodged at the Magistrates Court and if the order is breached the court can impose a penalty or vary the order. A confidentiality order prevents the alleged offender having access to the information given to the court. The information is still provided to their legal representatives. The court can only make this order if it is satisfied that disclosure of the information would cause serious harm to the alleged offender’s health or would put the someone else’s safety at risk. If a confidentiality order is breached without a reasonable excuse, the person who discloses the information can be fined.